It seems rather odd that Mary shouldn’t be able to recognize the risen Jesus when she sees him as she visits his tomb. The simplest reason of course could very well be that she had been crying all this time and the tears in her eyes prevented her from recognizing him at once. When a person loses a loved one, the sorrow he feels in his heart is often so overwhelming that one becomes unable for a period of time, to see or feel anything joyful or happy. But Mary wasn’t able to recognize Jesus, not because physical tears were blinding her eyes. Rather it was the suffering and pain in her heart that prevented her from recognizing him. And so, when Jesus tells her not to “hold on to him”, he was really asking her no longer to hold on to her sorrow and loss. He was asking her to let go of whatever was burdening her heart and her soul. He was asking her to let go of her inner pain. This too is the message of every Easter for each one of us. We too, have had our share of the tough and painful experiences of life. 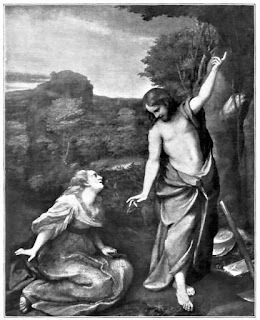 And at times, we shall be like Mary Magdalene, unable to see beyond the grief and sorrow that we feel, unable to let go. This Easter season, Jesus invites us to ask ourselves if there are not things we still hold on to like Mary Magdalene: past hurts or sorrows, past grudges or pains. And we are invited to put our trust in the Risen Christ, and to slowly let go.